Simplicity, Agility, Collaboration, Innovation and Ownership. Five words that hold the secret to CHC Helicopter’s success. Despite challenging market conditions in the energy sector, our corporate values and have helped us adapt, develop smarter, safer ways of working and embrace new opportunities. Nowhere has this rapid evolution been more apparent than in the emerging field of renewables. Offshore wind operators are increasingly recognising the benefits of utilising helicopter operations to support construction and maintenance activities. In the past five years, offshore wind has emerged as a mainstream sustainable energy source in Europe. Close to 13GW of installed capacity is already supplying power to homes and businesses across Europe, but installed offshore capacity is expected to increase to 70GW by 2030, according to WindEurope, the voice of the European wind industry. By that time, it is expected to be meeting between 7-11 percent of Europe’s energy demand, with 84 percent of that capacity installed in the North Sea. 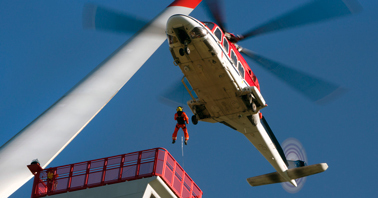 At the heart of CHC’s renewables offer is our growing reputation in supporting Commercial Helicopter Hoisting Operations (CHHO); a versatile capability being shaped through our operations in Den Helder in the Netherlands and Humberside in the UK. As the number of connected turbines increases across the region, so too does the need for planned maintenance, servicing for which will often necessitate an engineer being lowered directly onto the turbine. The Leonardo AW139 has proved to be an exceptionally capable and versatile aircraft for delivering CHHO missions. As CHC global Centre of Excellence for all Leonardo aircraft, Den Helder is ideally equipped with the skills, knowledge and operational insight to develop and refine safe and efficient CHHO operations for our customers. In a first for the Netherlands, CHC recently opened a new training facility in Den Helder, which will provide dedicated classrooms and dry training facilities to support the training of engineers in preparation for hoisting operations. In terms of crew training, CHC has unmatched experience operating the AW139 ­– we were the worldwide launch customer for the aircraft type in 2004. Prior to conducting commercial hoisting, all CHC crews complete a specialist, modular-based training programme, developed in-house, to equip them with the skills necessary to conduct safe and efficient operations. In addition to simulator-based training delivered in conjunction with manufacturer Leonardo, in Italy, crews undertake hoisting training in support of offshore operation; wind turbines; and if required, a module focused on marine hoisting. With almost half of new offshore wind capacity set to be installed in Europe between 2018-2020 destined for UK waters, operations from our Humberside base, on the UK’s east coast, have been expanded. In 2017, CHC secured a six-year contract with Ørsted to support the construction and first five years of operations on Hornsea Project One, which once completed will be the biggest windfarm in the world. Located 120km off the coast of Yorkshire, UK the windfarm will ultimately supply clean electricity to well over one million homes. The contract will be delivered in partnership with Uni-Fly – a specialist operator with extensive experience of hoisting operations to offshore wind turbines and installations. The partnership with Uni-Fly is based on a tried and tested collaborative model, shaped through collective experience gained from an earlier Ørsted wind farm project - Westermost Rough. “When Uni-Fly first moved to Humberside, operating an EC135 aircraft on hoisting operations in 2015, CHC provided handling operations and ramp support,” says Dave. “We also provided space in our hangar for maintenance and acted as the main point of contact with the customer. That model has formed the basis for our Hornsea contract. CHC will be supporting Uni-Fly during the AW169’s entry into service later this year. Following the success of our recent entry into service programme developed for the H175 in the UK, as well as the AW189 in Australia, CHC will assist Uni-Fly as it transitions from single pilot operations to dual crew operations on the new aircraft. Significant investment at Humberside has also completely revamped the heliport, providing enhanced passenger facilities and new information screens. Briefing rooms have been expanded to accommodate larger aircraft types and provide more space for changing, while the inbound arrivals area has been streamlined. Ultimately, today’s customers are seeking transnational solutions. They want a single, safe, reliable and versatile partner to serve their needs across different countries and regions. With our base at Den Helder emerging as a de facto global centre of excellence for commercial helicopter hoisting operations, coupled with our growing capability in the UK, CHC has the equipment, infrastructure, skills and experience to serve the needs of a rapidly-expanding global renewables industry.